These industries often require workers to live in remote locations for a short period of time; the location changes may be seasonal or based on the availability or resources. Whatever the case, shipping containers can form the base of temporary housing units in many industries. Shipping container homes are a versatile, portable solution to temporary housing. Instead of needing to get a construction crew out to the site, you can simply have the boxes shipped ready for set-up; all that's needed for set-up is level ground. In addition, shipping is a simple process because shipping containers are made in standard sizes designed for transportation using a wide variety of channels. Once your operations have moved, you can take your industrial or military shipping containers with you, and be ready to set up camp in a new site or with new employees as soon as the containers are moved. Shipping containers can house teams of workers comfortably even in a small space. For example, 40' shipping containers can be equipped with up to four bunk beds to house up to eight people. (If your needs are less, smaller shipping containers equipped with fewer beds are available). Falcon offers designs with private restrooms, or nearby you can place basic hygiene facilities such as showers and restrooms. Depending on your needs, you can choose a variety of options in your work camp. You might just need housing, or you might need a full camp equipped with facilities such as offices, laundry, a mess hall, even recreational facilities; it will likely depend on just how temporary the housing is, and how close by your full facilities are located. 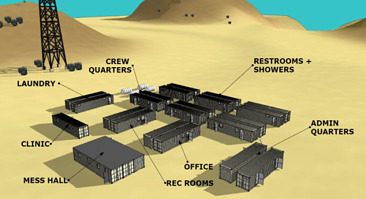 For example, military shipping containers might be used for more long-term training facilities, through which trainees pass relatively quickly.